Say hello to the Family Bridge. 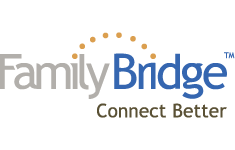 Family Bridge is a revolutionary online treatment tool, used by parents and therapists, combining professional coordination, an un-matched parenting library, and the input and creativity of the natural support system of friends and family in the client's life. How do I get a team demo? Fill out the form to the right or simply call us and we'll schedule a webinar for your administrative and clinical team right away. This 40 minute test-drive is sure to leave you a hundred pounds lighter as you move out of the stone-age of communication and collaboration with parents and treatment professionals. Sign me up for a free demo. Consider this the virtual dashboard for parents. 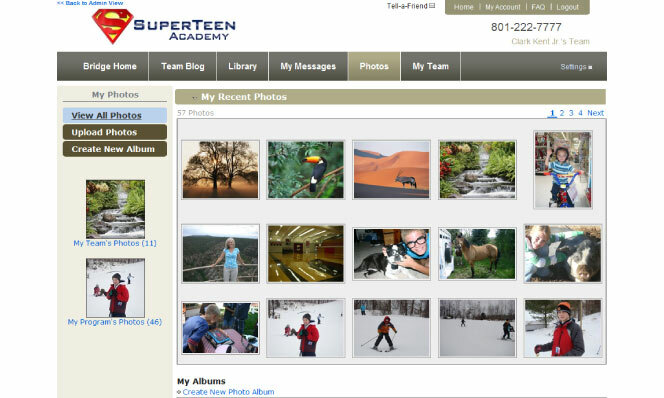 Capturing the four most recent photos, it grabs them visually and then provides a quick view of recent program announcements, upcoming events, and their teen's typical schedule for that specific day. It displays the parents' current tasks and goals to keep them focused on their work. 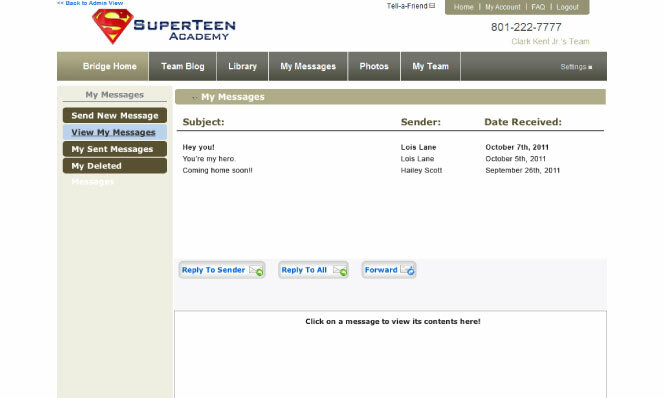 Definitely one of their favorite pages, it's where parents can access letters from their teen and updates from the program. Because we like to keep things simple and fresh, every time they log in, it features "What's New"
Want to get a message of encouragement or insight out to everyone on your Family Bridge? It's easier than an email and a ton more fun. Just create a new post on your blog and "click." The message is uploaded and an email is sent out to everyone inviting them to read and comment. 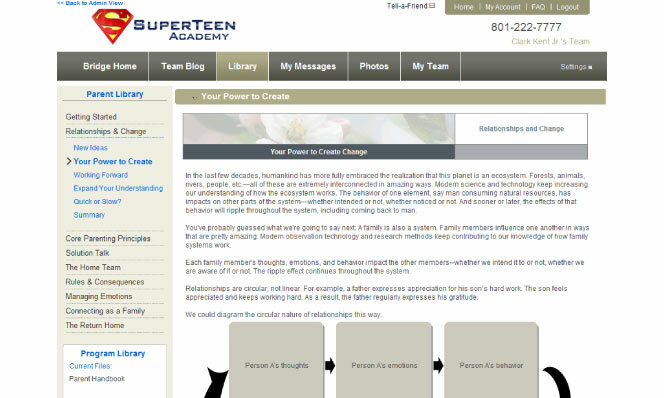 Parents can also post private blogs to their own family and friends, keeping them all in-the-loop on their teen's progress and the great work being done in your program. This helps keep the team at home connected and ready to support the teen when the time comes to return home. A snapshot of the teen, along with their current level (if applicable) is also found here. For families, writing letters of encouragement has never been simpler. Just click the link and type away. Don't have time to finish? Can't remember what you wrote last time? No problem--unfinished letters can be saved and old letters are handy to review. For programs, receiving and printing the letters is so slick, with features that allow you to sort by student name or therapist name whatever fits the bill. Concerned about the quality of your curriculum for parents? Not anymore. The Parent Library contains hours of reading and listening that will make your family work so much more effective. And the best part is it's customizable. So if there's a topic you don't want, you can remove it with one click. Tired of having to remember to email the same documents to every new family? Now you don't have to--upload documents and/or create links for all of your families to access them right in the Program Library. A personal library is all ready to go, where each family can choose to store private documents such as psychological evaluations, helpful articles, or transition plans. These can then be shared effortlessly, with any professional helping the family. My Messages makes communicating with anyone on the students Home Team a breeze. It works very much like email, but without the hassle of trying to remember who to write to, which address to use, and what you've shared already. In addition, for professionals, it provides a secure way of sending and receiving messages that is way more confidential than email. Want to triple parent satisfaction overnight? We guarantee that every parent lives for photos of their teen's experience. Let them view, organize, share, and take these memories with them when their teen graduates! Family Bridge does exactly that. Adding photos to the Bridge is super easy with the very popular Group Updater feature, allowing you to upload photos to more than one student at a time. Bonus: programs aren't the only ones who can upload photos. Family and friends at home can share photos with their own Home Teams. We honestly can't think of a more enjoyable way to stay connected. Gathering together a support team has never been easier. In a matter of minutes, parents can use the tools on this page to send out customized invitations to family, friends and professionals to become a part of, what we call, their Home Team. 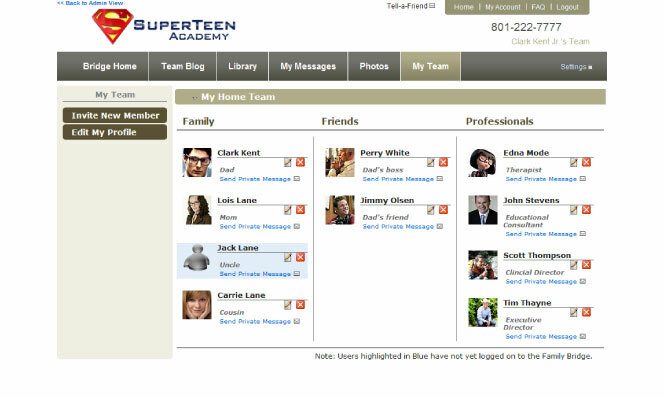 Once on board, this page shows the entire Home Team at a glance, giving names, pictures, and relationship to the teen. Understand the strength that this visual reminder provides. No one is alone not the parents, not the teen, and not the professionals. We know how busy you are! That's why we created a 'back stage' door to the Family Bridge that is only accessible to the staff in your program. This page provides quick access to all of the features and families on your Family Bridge. We also know how beautiful it is to have the power at your finger tips. That's why we have given you the ability to customize almost every feature on your Family Bridge. 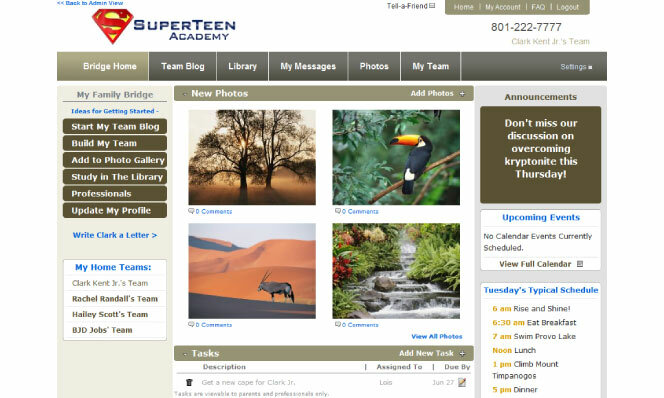 For example, those who are given "Administrative Level" access can add/remove staff and students, customize the Parent Library, tailor the automated email invitations that get sent out to individuals when they are added to the Bridge, create specialized updates unique to your program, and much more! *ask how to get a 50% discount! For therapeutic boarding schools and residential treatment centers over three months in treatment length. Families will keep this even as they transition between programs and finally return home or age out. For short-term and wilderness programs of under 100 days. Families are free to keep their membership for as long as they'd like to use it. For any program who wants to keep their family's close through continual communication and news on the Alumni Bridge. An unmatched way to reach out to and maintain relationships with happy families and referral sources. How is it different from what we already have? Though a program may have a parent portal of some type allowing them to post announcement, photos, and other general information to a website for parents to view, the Family Bridge is different in three significant ways. First, the features found on the Family Bridge go way beyond that of any parent portal we have come across. Second, the Family Bridge is not a website parents have access to but rather an actual tool they are given that they retain forever! Third, the Family Bridge has the capability of bringing together a support team who will encourage your students and be ready to provide accountability when they return home. To understand the specifics on these three differences you'll definitely want to experience one of our online demos. What if we don't want 'such and such' feature? Although most programs are thrilled with all of the features found on the Bridge, we know each program is unique and what makes sense for one doesn't always for another. For that reason, many of the features are what we call "ghost" features. Meaning, if you choose not to use a feature, it simply doesn't show up on your Bridge and your parents will never know the difference. Are there any hidden fees (set up fee, cancellation fee, etc.)? Can we start and stop whenever we want? Absolutely.Your contract with Family Bridge is month to month.If you feel you aren't getting the service you need, just say the word and we'll bring your subscription to a close immediately. Will we be stuck in a contract? Absolutely not. The Family Bridge can be cancelled at any time. Once you see what it can do and how thrilled the parents are with it, you'll understand why we have a near 100% retention rate. How easy is it to get our Family Bridge up and rolling? With our support and the help of a short Quick Start Guide, you can easily have your personalized Family Bridge up and running in a couple of weeks. It really is that simple. You'll be amazed at the parent satisfaction that comes with such little effort! Call now to schedule your test drive! Administrative dropped balls, playing phone tag, and lack of collaboration around transitional and clinical support are issues of the past. Upload and confidentially share psychological evaluations, assessments and clinical notes with parents or other professionals on their team in mere seconds. Nothing is more nerve-wracking for program professionals, than sending a teen back to a home environment that lacks the structure and education to sustain a smooth transition of what was gained into the real world. Family Bridge provides parents with an interactive on-line parent library, developed specifically to prepare them for their starring role in this transition. Program owners know what happens when parents feel disconnected and out of sync with the program... they pull their teen prematurely. With Family Bridge, parents are kept "in the loop" from day one. They know schedules, see pictures, read blogs, and get specifics on their son or daughter without having to wait for their weekly session with the therapist. Keeping parents informed, keeps the number of panicked or angry calls to a minimum, so you can devote yourself to the work of treating their child. It also saves a tremendous amount of lost revenue. No matter how good your clinical work is, if you aren't continually marketing yourself, you will struggle. Family Bridge is a brilliant way to reach thousands of potential referral sources, without marketing. When family, friends, and other professionals see your logo repeatedly, interact with your program professionals, and witness your professionalism and efficiency around one of "their own", who will be top-of-mind the next time they need answers for a troubled teen? That's right, you! Therapists know and research shows that parents who are more engaged in the treatment process experience far better outcomes than those who are not, but taking the time to come up with ways to continually engage parents can be taxing on the therapist. Family Bridge is a social networking tool with a clinical twist. Not only is it used by parents and therapists for coordination, communication, and collaboration, but it draws parents into your program through pictures, letters, and "good news" tidbits that are coming to them automatically. Imagine parents learning, growing, being a fly-on-the-wall, and gaining confidence in their choice of program, all because of the automated processes available on Family Bridge. The Family Bridge has allowed our program to finally institute the aftercare component our families so desperately need. It is user-friendly, informative, and impressive, allowing parents to track developments in their child's treatment process and build a network of people committed to maintaining the families treatment gains. This is a powerful and useful tool that we, as a program, are very proud to incorporate. We've been using Family Bridge for a year and a half now and it's been fantastic! Even the least tech-savvy parent or staff can learn it in about 5 minutes and they love it. From their first day in the program our families are introduced to everything the Family Bridge has to offer. Doing this has helped our parents be better prepared for real world success. As a Bestnotes user, the integration with Family Bridge has been seamless! The Homeward Bound website and the Family Bridge were very helpful to usthere were curriculum resources, audio files (especially helpful), and specific suggestions on how to build a network of friends who would help when our son came home. This became really important, because it strengthened the support we have from our family and friends, and we would find that it became crucial later on. We were also a little surprised to find that we had 16 people that we could count on to be seriously committed to helping our son after his return home. 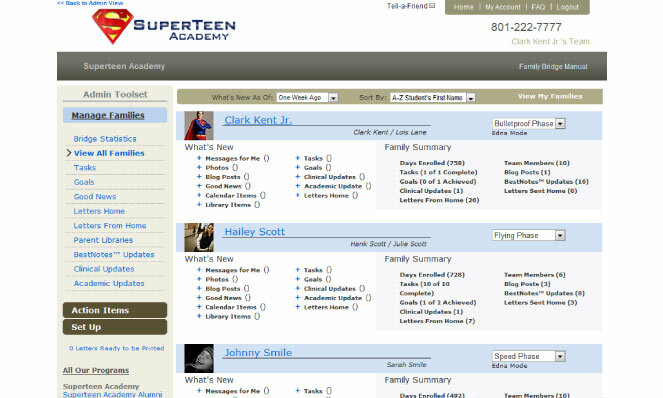 When a program asks us about the best technology for a parent portal, we recommend Family Bridge without reservation. Now that we've integrated our two products, it's a great fit. This tool increases two-way information flow, confidentiality concerns, organizational needs, student communication systems and other treatment systems in one, great looking package. Administrators, clinicians, program staff and families will all benefit from the use of this innovative program. Family Bridge has set up systems and benefits for our clients that are quick, easy, and give anyone associated with that teen (professionals, family, or potential clients) a real WOW experience with us. We would never give up Family Bridge, especially at such a no-brainer price!" When I first saw The Family Bridge I was really exited about this fabulous product. I wish I had this tool available to me ten years ago. I could have run a better program. I want to pass on how impressed and appreciative I am of your organization's decision to provide such an incredible and useful tool at such a low price. It's becoming more and more rare to find companies who are not simply out for the financial gain, but who are truly out to help and serve families, and assist other programs who are committed to doing the same. As a new program, please know we are extremely grateful and excited to have the ability to utilize such a great tool. I love being able to fire off a note to [my daughter] quickly. And it's great seeing her progress reports and especially the photos! Here at Family Bridge, only the utmost customer satisfaction is tolerated. If you experience any technical difficulties, general problems, or just have questions about our service, feel free to give us a call anytime. We are constantly trying to improve the functionality of the Family Bridge to further compensate the needs of customers, so any and all feedback is greatly appreciated. Thank you for your interest in the Family Bridge. We'll be in touch with you shortly. Copyright 2011 Family Bridge Inc. All rights reserved.